I owe this all to Heather ...at least I think that's her real name... at The Last Splash. She is a new mommy and sarcastic sister like myself. 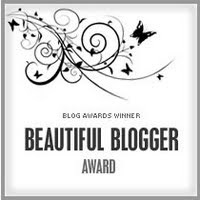 Her blog is both funny and tender, and I'm not just saying this because she nominated me for this award. I would be lying if I said I didn't care if people read my blog. That's not to say that I care if you LIKE my blog or not, it just matters to me that you read it and have some sort of opinion on it. Writing to me has always been a passion, and since my lifelong dream of writing a book may never come true, this little blog is the closest thing to published work I have. So the rules of this award are simple: Share 7 interesting facts about myself with you and nominate 7 other bloggers to pass this award to. 1) I was baptized Lutheran and then my parents converted to Catholic. My husband was baptized Catholic and converted to Lutheran. I don't know why I find this funny but I do. 2) The idea of doing the same job for my whole life scares/bores the hell out of me. Maybe I just haven't found my niche yet. Until then I accept donations. 3)I am obsessed with quotes and have a book that I keep the one's I like in. I started it in 8th grade and I still whip it out every couple weeks. 4)I didn't get my license until I was 21. 5)I blow dry my hair/put my make-up on naked. I need to break myself of this habit now that I have children. 6) I am scared to have a 2nd child because Jackson is such an incredibly easy baby. I can't fathom that I would be that lucky the 2nd time around. 7)I am a TV junkie and love my DVR. Actually, Bailey, from B's Blog Boutique designed it, but I've started doing some designing myself. Love your honesty about wanting people to read your blog! I feel the same! (And Heather is not my real name...) I like to keep 'em guessing.